This Rochester, NY quartet spent the second half of their lifespan as Jet Black Berries, but they wasted nary a second of their arguably more rewarding nascent years as New Math. I dedicated an entry to JBB's Sundown on Venus a good five years ago, wherein I went into their background in slightly more detail. Under the New Math incarnation, frontman Kevin Patrick and his cohorts were responsible for a couple of memorable punk singles, but they achieved full on righteousness on the subsequent They Walk Among You ep (1981, courtesy of 415 Records) and in three years time on Gardens. 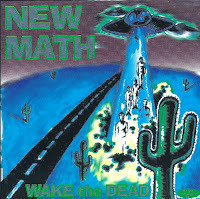 Wake the Dead is a gently tweaked consolidation of those recordings. The arguably cheesy sleeve art to your right is a bit of a disservice to the caliber of the tunes housed within. 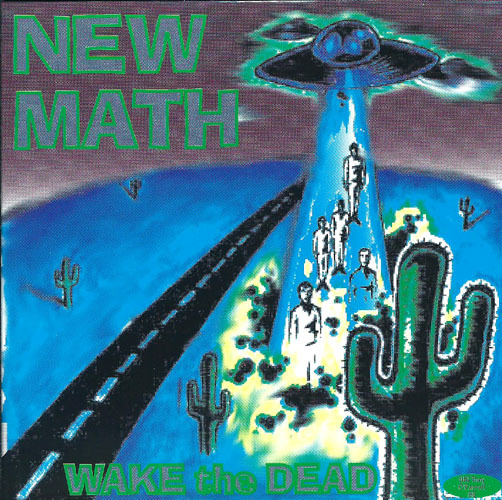 Yes, there was a discernible b-movie undercurrent to New Math, but luckily for anyone within earshot the emphasis was squarely on the songs, not so much the shtick. Their sonic aplomb was largely defined by synth maestro Mark Schwartz, whose driving keyboard fills colored NM's relatively diverse palette that ranged from punk to garage to even something approaching conventional pop. And despite hailing from such a wintry locale, the band seemed content to tip their collective hat to west coast contemporaries, running the gamut from the Gun Club to T.S.O.L. NM's "mystique" may strike some ears as a bit dubious or even occasionally feigned, but with cuts like "Invocation," "Love Under Will," and "Ominous Presence" packing such robust melodic content, the inherent lyrical sentiments pass by as almost secondary. Amidst New Math's typical indigenous sound, as it were, there are a couple of striking anomalies in this collection that I'd be remiss if I failed to highlight. "American Survival" oozes an uptempo punk pedigree that Bad Religion only wish they could have conjured up for their synthy sidestep, Into the Unknown, while the bangin' "Johnny on Top" was liberally modeled after the Jim Carroll Band staple, "People Who Died." Not to be missed.